ARF | Cats | I'm London, Adopt Me! Seven-year-old London is as drop-dead handsome as a guy can be with his beautiful swirly markings. He's not just good looking, though. 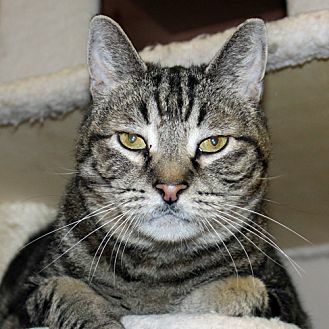 This well mannered gentleman is friendly, affectionate and has a thunderous purr that comes on the moment he is petted. London is bonded to his sister Paris and they need to be adopted together so they can continue their loving relationship. They'll also provide lots of love to their new family members. What a sweet pair! London's adopter must be at least 18 years old with valid-state issued identification. ARF encourages family members to participate in the adoption process, especially children. Please visit ARF's web site for information on adoption and to view more great cats. [description] => Seven-year-old London is as drop-dead handsome as a guy can be with his beautiful swirly markings. He's not just good looking, though. This well mannered gentleman is friendly, affectionate and has a thunderous purr that comes on the moment he is petted. London is bonded to his sister Paris and they need to be adopted together so they can continue their loving relationship. They'll also provide lots of love to their new family members. What a sweet pair!